Liquid Level Indicator - Pour Liquid Without Overfill. It has never been easier to make a drink safely than with our liquid level indicator. 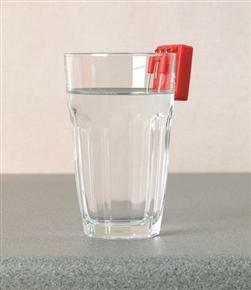 Designed specially for those with a visual impairment, this clever little device helps the user to pour liquid into a receptacle confident that they won’t overfill. It works by simply placing the unit on a side of a cup. A series of audible beeps will let you know when you’re nearing the top, and when it is full. Supplied in a distinctive bright yellow, and with 3V cell batteries included, with the RNIB stamp of approval. I bought this for my elderly neighbour who struggles with her eyesight and this has enabled her to make hot drinks for herself safely, therefore ensuring she maintains her independence. Very quick delivery and excellent price .